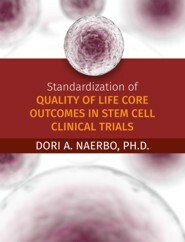 by Dori A. Naerbo, Ph.D.
Background: Establishing standardized Quality of Life (QOL) core outcomes in stem cell clinical trials is important to ensure (1) researchers and clinicians can make informed decisions, and (2) clinical trials use and consistently measure the same units (Clarke, 2007; Thornley & Adams, 1998). This study reviews the most common QOL methodologies, timing/frequency of the measurement, and outcomes in cardiovascular stem cell clinical trials. Methods: To identify instruments, the study reviewed MEDLINE, Scopus, and US Clinical Trials Register through September 2010, and randomized BMSC controlled trials of clinical trials from 2000-2011. The trials all used the terms (bone marrow stem cell AND quality of life OR heart OR cardiac) AND cardiac AND quality of life OR QOL. The study included a Likert scale web-based questionnaire comprised of eight questions designed to assess QOL patient satisfaction post cardiovascular stem cell treatment. Results: Of the instruments identified, the study found that bone marrow stem cell (BMSC) clinical trials used 35 different types of methodologies, whereas cardiovascular BMSC employed more consistent methodologies. Timing, frequency, and baseline were consistently measured in BMSC clinical trials, whereas cardiovascular BMSC lacked baseline consistency and were measured primarily after treatment. Cardiovascular BMSC outcomes were consistent, whereas BMSC clinical trials had multiple outcomes. The mean participant age was 56.25 years with a minimum age of 46 years and a maximum age of 61 years. Participants generally were educated with a minimum education level of an Associate degree and a maximum degree of Doctorate. The patient satisfaction survey revealed that participants preferred yes/no questions and surveys that required less than 15 minutes to complete, received via email, easy to understand, not too personal, relevant to feelings, containing a baseline measure, and medical-condition specific. Conclusion: QOL outcomes are rarely assessed in BMSC cardiovascular trials. Treatments are performed all over the world, and no one knows whether these treatments actually are effective. Both standardized measurements and additional studies are needed. Dori Naerbo, PhD, MSBA and MSc is a University of Liverpool graduate and specialises in stem cell clinical trials, commercialisation of cellular treatments and business development. Dr. Naerbo is a successful entrepreneur and author with over twenty years of diverse business experience. Areas of expertise include biotech, clinical research, global knowledge management (KM), R&D (special interest in cardiovascular stem cell applications), life science (Phase I and II), mentoring and crisis management. Dori provides access to her network of world class scientists and researchers in manufacturing, cellular technologies and treatments. Dori speaks English and Norwegian, and holds a Ph.D. in Organisation Psychology, MSc in Business Administration and MSc in Clinical Research.